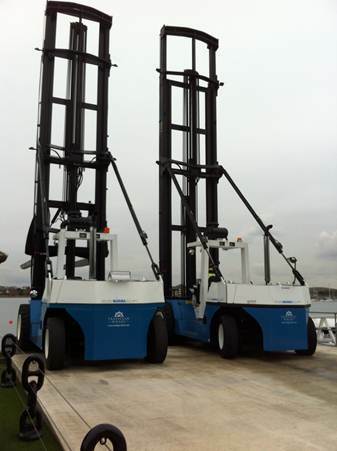 The Drystack at Trafalgar Wharf has taken delivery of its second giant Wiggins Marine Forklift, underlining the continued expansion of the marine industry for Portsmouth. “We’ve had so many boat owners join us at The Drystack in phase one that we decided to invest in a second Wiggins,” says Jonny Boys, MD at Trafalgar Wharf. The two giant Wiggins machines are an impressive sight, lifting boats of 8.5tons and up to thirteen metres long off the ground to store them in giant indoor racks. Boys is confident that “drystacking” is the future with its convenience and zero-hassle factor becoming the required marina offering in the future. Captain Horatio Pugwash, awaiting your orders….